In continuation of my post about running, I would like to add my thoughts on running barefoot, which is an increasingly popular trend now. I definitely support the movement, especially if you run bare, why not run barefoot as well? In my childhood, I was encouraged to walk barefoot by family during summers; they didn’t put much explanation to it, just said it was healthy. I didn’t really practice it seriously, and got interested in the idea again after I broke my foot almost 3 years ago. I quickly came to a webpage of a group from Harvard University that had been doing extensive studies on running. One of the conclusions of their work published in the most respected scientific journal Nature was that barefoot running style may actually “protect the feet and lower limbs from some of the impact-related injuries now experienced by a high percentage of runners”. I would suggest you to go to the website of the Harvard Uni group for more details and videos explaining the benefits of barefoot running, and if that doesn’t convince you, there is a more graphic and visually pleasing website of a minimalist shoes producer Vibram, which is, I must add, also naturist-friendly 😉 The take-home message is that while running barefoot, you use all those muscles and tendons that are otherwise left untrained if you only walk and run in traditional shoes, AND the pattern of the foot strike changes from heel-strike to shock-absorbing and collision-reducing fore-foot strike. In other words, you make your feet and calves stronger and learn how to step more cautiously (without actually thinking about it). When I did my search now before writing this post, I found several articles claiming the opposite, for example that ‘Doctors see uptick in foot injuries from barefoot running shoes‘ (also see this one). However, none of those articles has been published in a peer-reviewed journal, and their claims that the new industry of the so-called minimalist shoes is nothing more but fashion do not have much base in my opinion, as the industry producing [currently] traditional running shoes is much bigger and has much higher capacities for advertisement. They acknowledge, however, that those injuries may be related to too sudden a transition from running in thick-sole to shoes to running barefoot or in minimalist shoes. That’s where I totally agree with these articles: before running your first marathon barefoot, get some experience by first walking barefoot and only then running, slowly increasing the speed. I think the ultimate goal should be being able to run totally barefoot (if not totally bare ;-)), but you could use minimalist shoes as intermediate stage. That was why I wore them for my first trail race. While I am now totally comfortable with hiking barefoot, I am not sure I could really run fast on a rough terrain like a forest trail with pebbles. That’s why I opted to stay in my Vibram Sprint shoes for the race, and I felt it gave advantage over runners in regular shoes. First of all, such minimalist shoes are much lighter, and you do feel it! Every step you take just feels lighter. Second, having flexibility in your feet and toes being able to move, even though slightly, helps with the grip, which is especially helpful on an uneven terrain. Third, this flexibility allows you to use only fore-feet, which I found very helpful when running uphill. There are several companies and numerous models of such minimalist shoes. 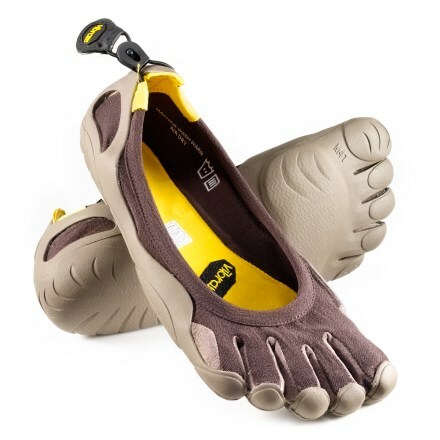 I used to have Vibram FiveFingers Classic, probably the most minimalistic of all minimalist shoes. 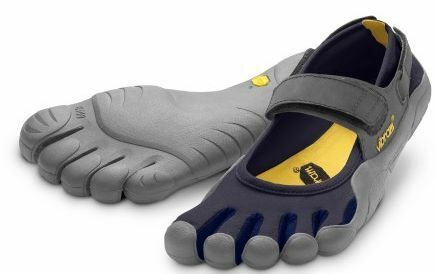 I really liked them and they served fine for jogging and travel, but after I lost them in a trip, I decided to try another model and went for Vibram FiveFingers Sprint. They turned out to be much more flexible, and they have three velcro straps that allow very fine adjustment, so they fit the feet just perfectly. In any case, I would strongly recommend to try those first, even if you find better deals online. There are many other models that look more elaborate, but I think that makes them less minimalist, which defeats their purpose. In my last hike, I kept my Vibram shoes on for the first couple of hours, and after I took them off I actually felt a relief – compared to walking even in these light and flexible shoes, walking barefoot feels even lighter, not to mention that you feet don’t get sweaty. That’s why I consider minimalist shoes just an intermediate stage. Of course, all of this implies walking at warm temperatures. Also, I would rather wear such shoes in the city than walk totally barefoot; there’s just too much spit, chewing gums, and occasional dog poo or even broken glass (at least in New York City).